Paula teaches a variety of stone carving courses throughout the year at West Dean College, Sussex. 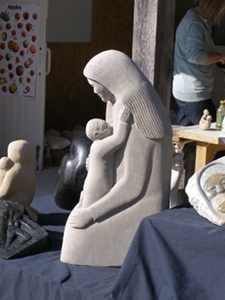 The next course is a long weekend 25th to 28th November 2011 entitled Carving a small sculpture in soapstone and alabaster. Please contact West Dean for details. At Redbridge Institute the next stone carving course starts 7th October for 20 weeks, 12pm – 3pm. Suitable for all abilities. At Brady Centre term starts 11th October 7pm every Tuesday. The Saturday workshops in Paula’s studio are dates 24th September, 29th October and 3rd December; 10am – 5pm. Contact Paula directly. Paula also runs workshops in schools, community groups and tailored activities for corporate groups. 2005 – 2006 HNC in Public Art, sculpture module. 10 week slots.